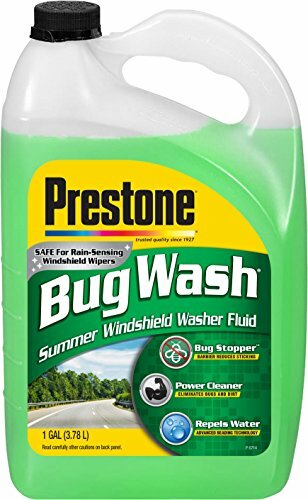 Prestone Bug Wash is a new, advanced windshield washer fluid formulated with ingredients to remove bug residue, road grime, bird droppings, and tree sap from windshields. This Prestone-exclusive patented formula cleans to a streak-free shine with a fresh citrus scent. Bug Wash delivers a powerful clean for summer driving visibility and removes bugs with three cleaning technologies. Power Cleaner penetrates the toughest residues, breaking down and removing up to 99.99 percent of all bugs. Bug Stopper forms a barrier to help stop bugs, road grime, and other residues from sticking to your windshield. Water Repellent Advanced Beading technology repels rain on your windshield for streak-free driving visibility.